If there’s a Halloween Grinch, I’m it. But in that I seem to be in a minority. It’s late October in the Outer Banks of North Carolina, and the spooky season is fast approaching. At the Bodie Island Lighthouse Library, we’re gearing up to celebrate it in style with displays of the creepy for adults and children. We will keep everything tasteful, of course. (Is that at all possible?). We’re having three events that day: one for younger children, one for teenagers, and then an evening party for the adults. Fortunately, the parties are being catered by Josie’s Cozy Bakery, so I know the treats will be to-die-for. The Saturday before the big day, Louise Jane’s giving a talk on haunted legends of the Outer Banks, and we’re expecting a big turnout for that. And, if that wasn’t enough, the Bodie Island Lighthouse Library Classic Novel Reading club is reading The Legend of Sleepy Hollow, by Washington Irving. Fictional ghosts, of course. There’s no such thing as real ghosts. Or is there? I didn’t really see something moving out in the marsh in the night, did I? 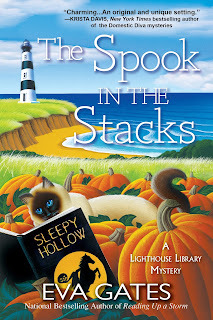 The Lighthouse Library series has moved to Crooked Lane Books, and the fourth in the series, THE SPOOK IN THE STACKS, will be released on June 12. With The Legend of Sleepy Hollow on everyone’s minds and ghoulish gossip on everyone’s lips, Lucy will need to separate the clues from the boos if she wants to crack this case without losing her head in The Spook in the Stacks. To celebrate its new home, Eva would like to give an advance review copy of The Spook in the Stacks to one lucky reader. Or, for those who haven’t started the series yet, we have a copy of the first, By Book or by Crook, to offer. Please leave a comment below to enter. US and Canada entries. Contest ends Saturday June 2. It should be right up your alley! I love this series because I work in a library, too! Looking forward to this new book. I have the first 3 in paperback..have not started them yet..would love a copy of the 4th! I love lighthouses, mysteries and Halloween!! I would SO love this!!! Thank you!!! Cannot Wait for the fourth book! Just finished listening to the thirst three again to prepare! Thank you for the opportunity. I can not wait for thi book to come out! Halloween spooky tales are always fun to read...thanks for the giveaway opportunity. They're even funner to make up. Looking forward to the fourth book. The first three were great. Thanks for the giveaway. Love the covers and all the books in the series sound like amazing reads. Love lighthouses. We even took one of our bucket list trips 2 years ago up the whole coast of Maine exploring the lighthouses along the way. Congratulations on your upcoming release of "The Spook in the Stacks"! Thank you for the chance to win a copy of "By Book or by Crook" so I can start reading this great series! Love this series! So happy It's continuing!! Great series, love that the library is set in a lighthouse. I'm pleased to hear that. Thank you. I am SO excited about the new book! This is one of my favorite cozies- it has everything I love. Books, lighthouses, and cats, oh my! Thanks, Sam. Your comments make me pretty happy! I have the 1st 3 books and love this series! lover and a cat lover I couldn't ask for a better series to follow. This is a new to me series. It sounds great. Love lighthouses! Thank you for the opportunity. I would love to win a copy. I’m so glad this series was able to continue. We vacation in OBX every other year and Halloween is my favorite so can’t wait to read this long awaited book! Sounds like the perfect book for you! Good luck in the draw. I've honestly been meaning to but I haven't started this series yet. So many books, so little time. Ugh! I love the sound of each and every one of them!!! THanks for the chance to win too! I have read the first book in this series and loved it! Thank you for the chance to win this one! I would LOVE to win the new book, The Spook in the Stacks! My fairie garden this season is a nautical theme, complete with a solar powered lighthouse & mermaids. A peaceful place to read your books! I'd love to review this too. Congratulations Nancy, you win the copy of The Spook in the Stacks. I'm sending you an email, if you could please reply with your postal address. I'm so glad this series is continuing. I really loved the first three books in the series. 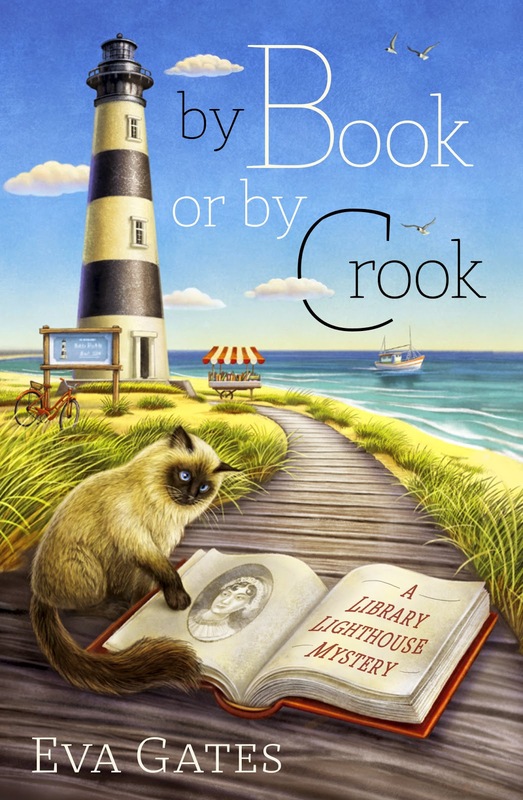 Great setting for a cozy, a library in a lighthouse on The Outer Banks and Lucy living there with the library cat. Can't wait to read. Have not red this series yet but would love too. Thanks for the chance to win! I would really love to live & work in a library in a lighthouse just like Lucy. I love Lucy and her co-workers and am so happy it's time for another book. I've worked in a library for years but never in a lighthouse. I don't think I could manage all those stairs Thanks for the opportunity. What a great series you have written! Wow! What a great series. Would love to have a book from it. Thank you for sharing this! I am looking foward to reading the newest installment in this series. Thank you so much for the chance to win! So glad you found a new home at Crooked Lane! Looking forward to reading the new book. Thanks for the chance to win! I would love the opportunity to discover a new series of cozy mysteries! I am a faithful follower of this series and would love to win a print copy of The Spook in the Stacks!! thank you for the chance! I love this series, so excited about new release! Great giveaway! Thank you for this opportunity to win! Keeping my fingers crossed. Thanks for the chance to win The Spook in the Stacks. Have the other books in the series in my TBR pile. I haven't read this series, I love lighthouses and libraries and cats! I had to look up the first one as I had not heard of this series. It looks like a fun one. So far I love this series. Read them whenever I find. This book has to do with one of my favorite holidays. So excited for the return of this series!! mcastor07 (at) Gmail (dot) com.